Yesterday, we wrote about the recent history of MCPS and it was not a pretty picture. 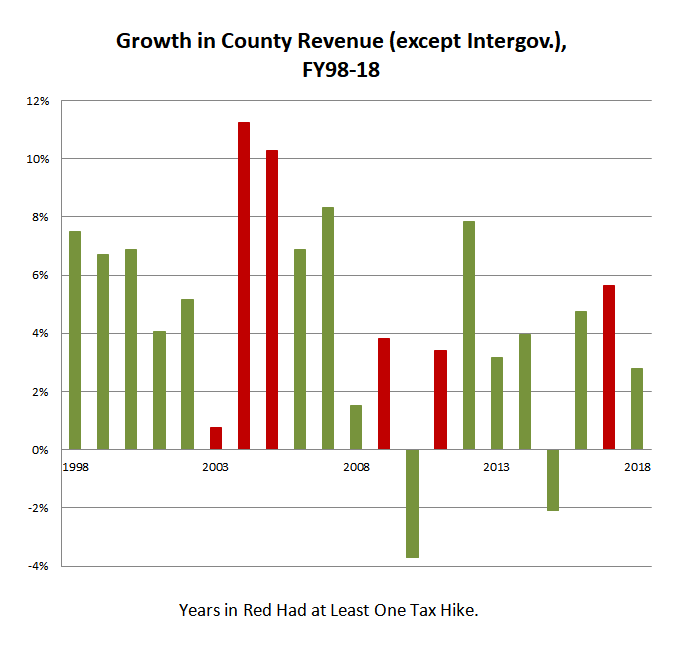 The recession, new state laws, political conflict and the erosion of a once-strong consensus around the public schools resulted in MCPS getting lower funding increases than most of the rest of county government, especially when measured in local dollars. 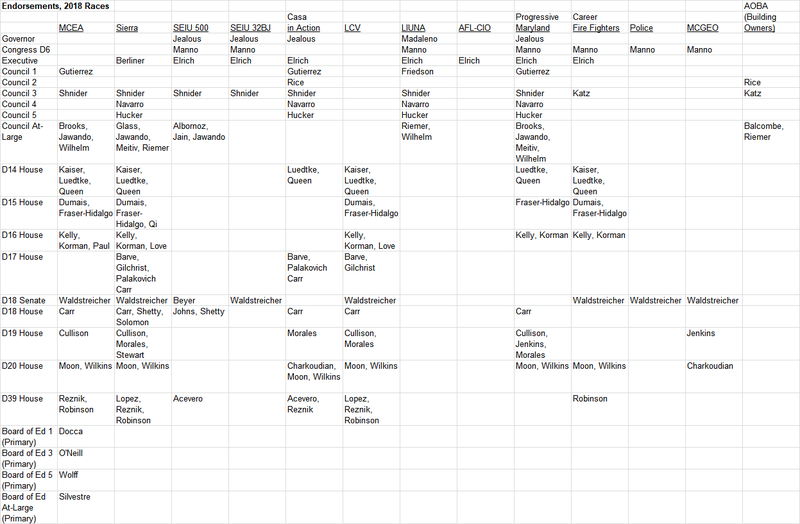 But the good news here is that change is coming to MoCo with the sheer number of open seats in county elected offices. There is a better way forward. And today, we will plot out what that way can be. First, let’s steal a page from the playbook of former MCPS Head Coach Jerry Weast and recognize this: nothing brings folks together like a common enemy. The Axis powers brought together America and the Soviet Union. The New England Patriots brought together nearly all NFL fans without ties to the Greater Boston area to root for the not-quite-as-bad Philadelphia Eagles. And Donald Trump may just bring together the feuding members of Crosby, Stills, Nash and Young, who hate Trump more than they dislike each other. The various factions of MoCo’s education family do not have a common enemy, but they do have a common challenge: dealing with Annapolis. 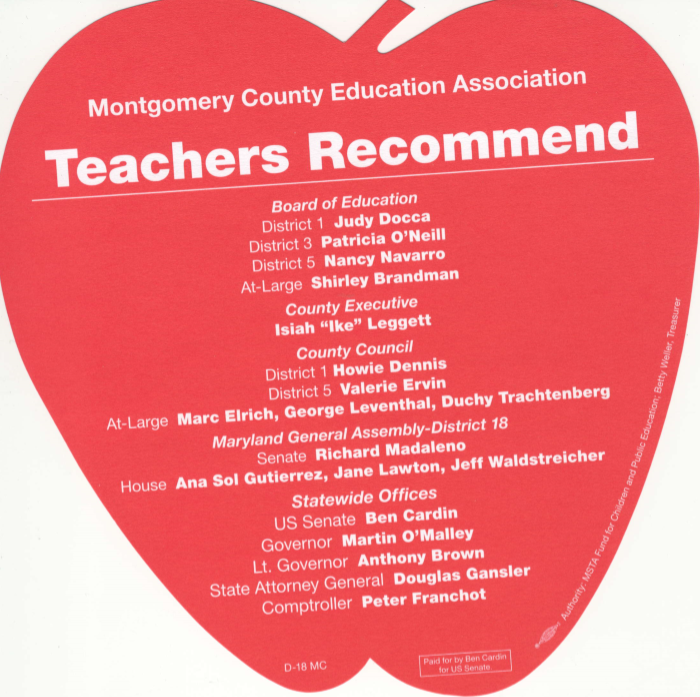 The state capital poses three problems for MoCo’s public schools. First, the state has a Governor who has cut education funding before (especially state aid for MoCo) and is doing it again. Second, while the state has improved recently, it still short changes MoCo on school construction money and the county cannot keep up with capacity needs on its own. And third, a consultant advising the state’s Kirwan Commission on education reform has recommended massive cuts to state operating aid to MCPS. 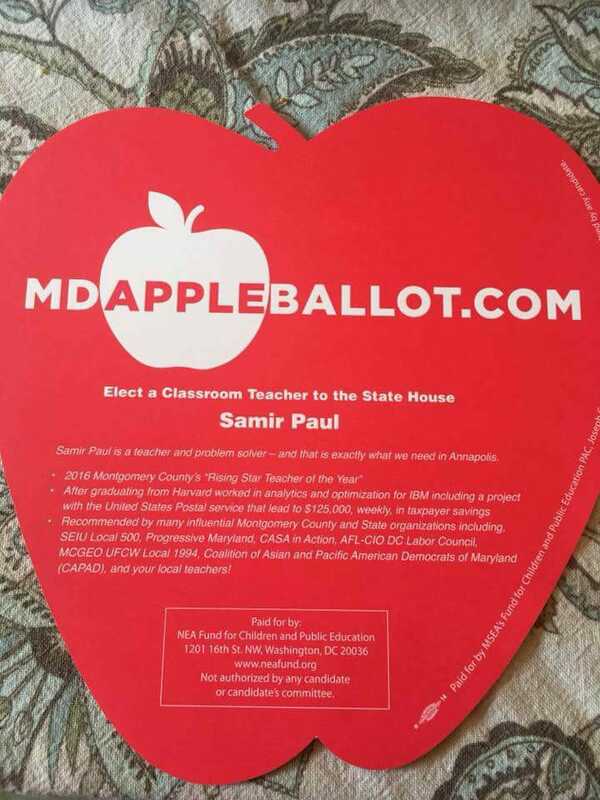 If all three of these things proceed in a baleful direction, MCPS’s funding issues will get a lot worse and the entire county – parents, students, school employees, residents and businesses – will pay a steep price. When you get past the details of MCPS’s recent money problems, one root cause stands out: political division in the wake of Weast’s departure. The County Executive, the County Council, MCPS leadership, the MCPS unions and the PTAs all have different priorities and different views on MCPS funding, and they often go in different directions. That has to stop or things won’t change. We need a Team MoCo. And here’s what that looks like. The council has one job when it comes to the schools: funding them. And since the schools are both a critical public policy priority as well as a big political priority for the voters, their funding situation must improve from the last eight years. 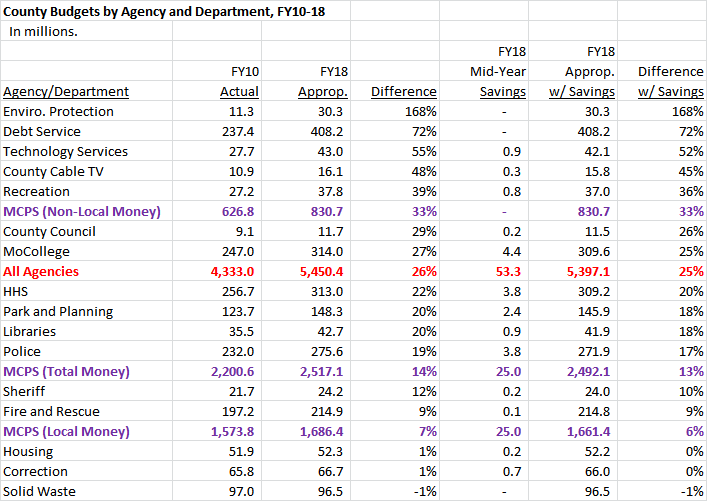 The council largely got this right in its FY18 budget, which gave MCPS a modest (roughly $20 million) increase over the state’s Maintenance of Effort requirement. The policy of regular, modest per pupil local dollar increases that will – at the very least – keep pace with MCPS’s costs and needs should continue. The council must not get involved in sensitive internal MCPS issues, especially in pressuring the system on its collective bargaining agreements. Blowing up the union contracts in 2016 was a major mistake and caused a serious breach of trust. Let MCPS management and the unions decide what the agreements look like in the context of their total budget. If the council does not stay out of this, Team MoCo will crumble and the entire arrangement will fall apart. If the council gives MCPS leadership the funding it needs, then MCPS leadership must reciprocate by giving the council what it needs: fiscal stability. The state’s Maintenance of Effort (MOE) law, which was rewritten in 2012, sets each year’s local dollar per pupil funding as a base for future years. Every time the base goes up, it becomes a new base and can only be lowered by a waiver from the State Board of Education. This is a major concern for the council and was partially responsible for several years of per pupil cuts and freezes. Given the immense implications of this for the county’s budget and AAA bond rating, the council is right to be wary of going too far above MOE. Fortunately, § 5-202 (d) (9) of the state’s education law specifies that the State Board of Education shall grant an MOE waiver “in the amount that has been agreed on by the county and county board that is attributable to reductions in recurring costs.” In other words, if the county falls into another big recession and it has to cut costs in the school system along with all the other agencies, it can get a waiver if the school board agrees. 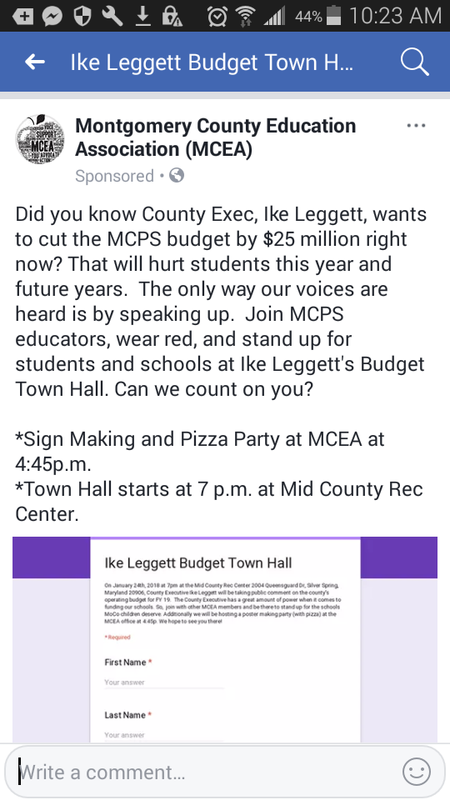 This deal must be honored by MCPS: if the council extends its trust by funding them, MCPS must agree to reciprocate by helping to relieve the county of financial stress in dire circumstances. Both sides must stick to this or relations will revert to the bad old years. MCEA and SEIU Local 500 are two of the most powerful players in county politics. The PTAs do not endorse candidates, but they have listservs that include thousands of parents and therefore – at least in theory – have a big voice. These organizations should function as the muscle of Team MoCo. They will be getting regular funding increases and, in return, they should help the Team pressure Annapolis to get what is needed for the county. If Team MoCo gets its act together and strikes an equitable deal for local funding for the schools, the remaining challenges lie in Annapolis. Rockville does not understand Annapolis. It does not fully appreciate the obstacles faced by the delegation in pursuing county priorities: the perception of MoCo by the rest of the state as paved in gold; the competing priorities of other population centers in the state; the constraining effect of the legislature’s leadership; and the fiscal constraints of the state’s own tight budget. Given those hurdles, it’s a heavy lift for the delegation to bring back Big Bacon to MoCo. But it can be done: witness the Baltimore City delegation’s victory in getting the state to pump a billion dollars into the city’s school construction program. The city legislators are not smarter than MoCo’s legislators (although they are more parochial). A big reason for their win was that the entire city stuck together, from the Mayor to the City Council to the city legislators to the folks back home who wanted the money. 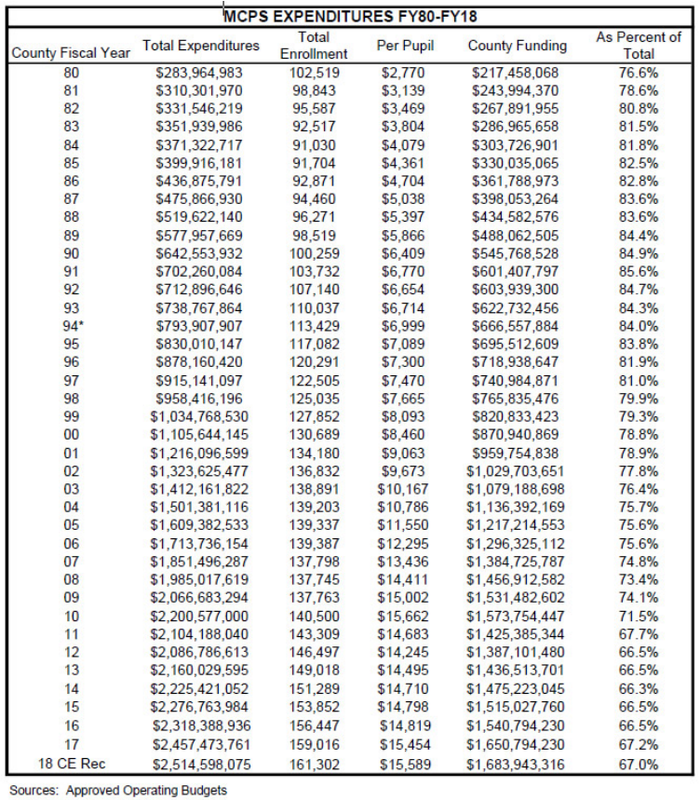 Team Baltimore got a billion dollars. We need a Team MoCo to do something similar. The role of the county leadership and its constituent groups is to set a mark for the delegation and do everything possible to help them stay organized and succeed. This is not easy; the other jurisdictions and the presiding officers won’t just roll over for us. Every member of Team MoCo has to tell our delegation with one unified voice, “We have your backs. We know it’s a lift, but if you come through for us, we will celebrate you like the heroes you are. You will never have to buy a drink for yourselves in Rockville ever again. And if you don’t come through, you will not be served a drink in Rockville ever again!” Good performance must be rewarded. Bad performance must be met with accountability. One more thing: the delegation has an ace card. Senate President Mike Miller and Speaker Mike Busch are not going to run the General Assembly for much longer. 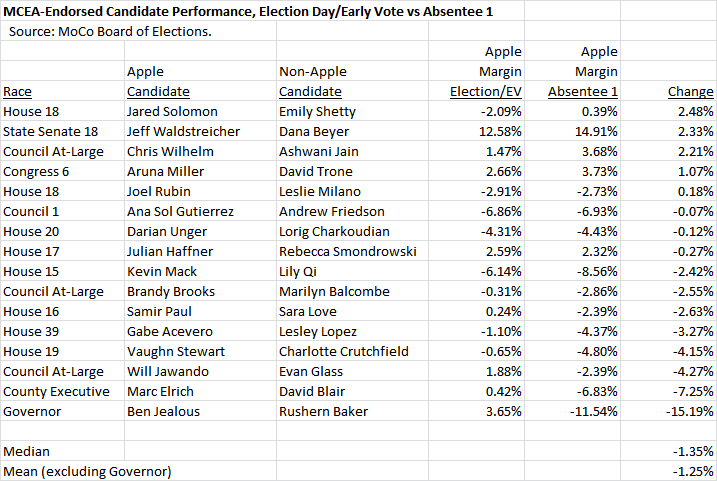 Successors to their thrones are making the rounds and lining up votes, however quietly. 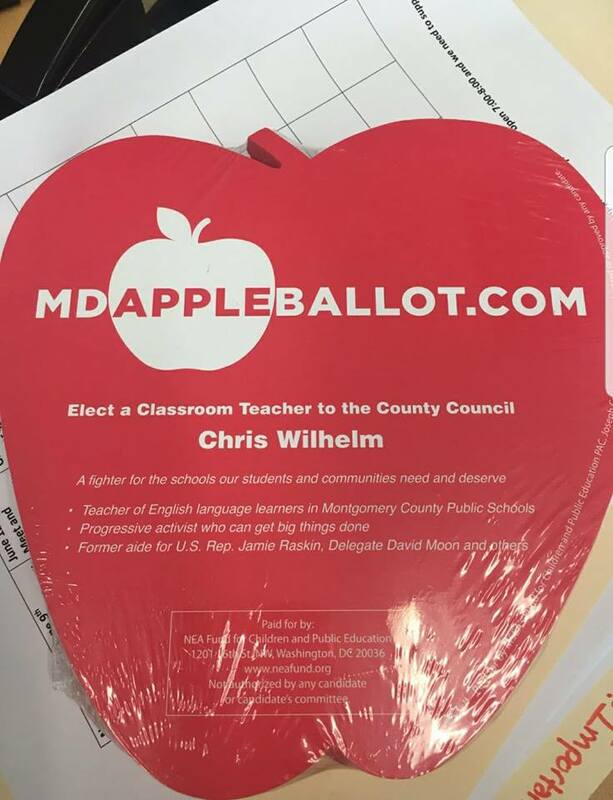 The MoCo legislators should tell all of them that whoever gives the county the best deal on schools will lock up all their votes. It’s huge leverage that should not be wasted, but it will only be used if it pays off in political terms. Team MoCo’s job is to make sure it does pay off so the Big Bacon gets served. This is the most critical person in this entire endeavor. Every team needs a Captain. In MoCo, that has to be the Executive. This individual is the county’s spokesperson and the one everybody else will inevitably look to for leadership. The Executive must be a troubleshooter who works out periodic squabbles between the different members of the family, charts out a general course on budgets and state action and makes sure everyone gets the credit they deserve. Most of all, the Executive must be a LEADER. The lesson from the aftermath of Weast is that without central leadership, everything can fall apart. If we pick the right Executive, that won’t happen and Team MoCo can succeed. And so if everything works out, everyone wins. The county gets its fair share from the state. MCPS stakeholders get the funding they need. MCPS employees get fair compensation and the resources they need to do their jobs. The elected officials get to be heroes. And the county as a whole will maintain its status as one of the best places to live on Planet Earth. We can do it, folks. Yes we can! If you agree, ask the candidates how they intend to play on our team and keep it in mind for Election Day. Team MoCo will only come together if the voters demand it.